Are you looking for the ultimate shooting experience that allows you to hone and work on a variety of skills in just one range? Well you’re in luck, because here at Buffalo Range Shooting Park we have a premiere Run and Gun Course in Ottawa. 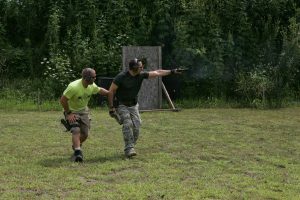 On the Training Range, you will get to harness all of your skills in one course. For more information on our shooting ranges and courses contact us at (815) 433-2471. We offer a variety of different styled ranges and provide firearm rentals as well as having ammunition available for sale. For our Run and Gun Course in Ottawa, we set up random cover fire positions, barricades and offer portable lighting for low light shooting practice. Here, on our Run and Gun Course, you get to deploy all of your skills and learn more. You get to shoot at multiple targets and while at your cover fire position, you can transition from your hand-gun to your rifle. This gives you a great opportunity to shoot at targets on the go. To experience one of the best Run and Gun Courses in Illinois, come to Buffalo Range Shooting Park! We have a variety of ranges for you to try out and better your skills as a shooter. We offer great pricing and discounts for those on active duty and veterans. So if you are just looking for a few hours of fun, or want to make a weekend out of it, call us today at (815) 433-2471 to get more information on what we have to offer at Buffalo Range Shooting Park.